100% squeezed juices are the healthiest juices you can find on the market. The reason is that this juice is made only with pressed or squeezed fruit and nothing else. Therefore, and in accordance with current legislation, they do not contain preservatives or dyes, nor do they have gluten, which is why they are suitable for celiacs. They contain no added sugars, only naturally occurring sugar from the pomegranate itself. Our 100% squeezed healthy juices are made from the pressing and squeezing of pomegranates grown in Spain. To guarantee the quality of the juice, we cultivate and select the best pomegranates from our fields in Alicante. 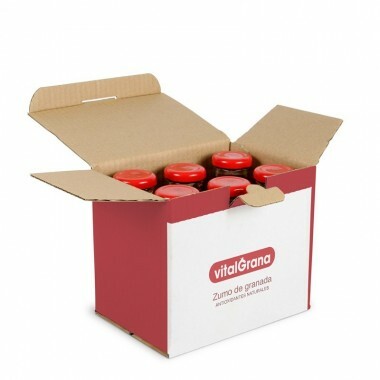 In addition, we carry out the squeezing through an innovative system that guarantees that all the properties of thepeel and the inside of the seeds, as well as those of the seeds and grains, are kept in each bottle of our healthy juices in a way that provides of the same compounds that the fruit has in its original state. That is why we can assure you that in each of them you will find a mini potential pomegranate. The healthy juices of 100% squeezed pomegranate have all the benefits and properties of this super-food: vitamins C, E, A, B1, K and beta-carotene, as well as minerals such as iron, calcium, zinc and, above all, potassium. These juices also have a high concentration of antioxidant polyphenols. For all these reasons, they are highly recommended as a component of leading a healthy life helping prevent diseases such as diabetes, obesity, cancer or heart disease. In addition, these healthy juices have a draining and diuretic effect due to the low sodium, but high potassium content. In short, 100% juices will be your best choice if you want a healthy, natural juice full of well-being. Choose yours, the size of your ideal bottle, 200 or 750ml, and let us start taking care of you. You will love everything they can do for you!